Most foraging honeybees specialize in either pollen or nectar collection, although some do alternate between both resources. Little is known about this behavioral plasticity and the factors that control it. We studied how the profitability of nectar sources influences the transition of bees between nectar and pollen collection at the individual response level, by measuring the number of switches when the productivity of a sugar source (either sugar concentration or solution flow rate) was experimentally decreased or increased. At the social level, we studied whether the quality of the nectar that circulates inside a hive alters the rate of incoming pollen foragers. We then calculated the ratio between pollen and non-pollen foragers, before and after the hives were fed either a 3 or a 50% w/w sugar solution. 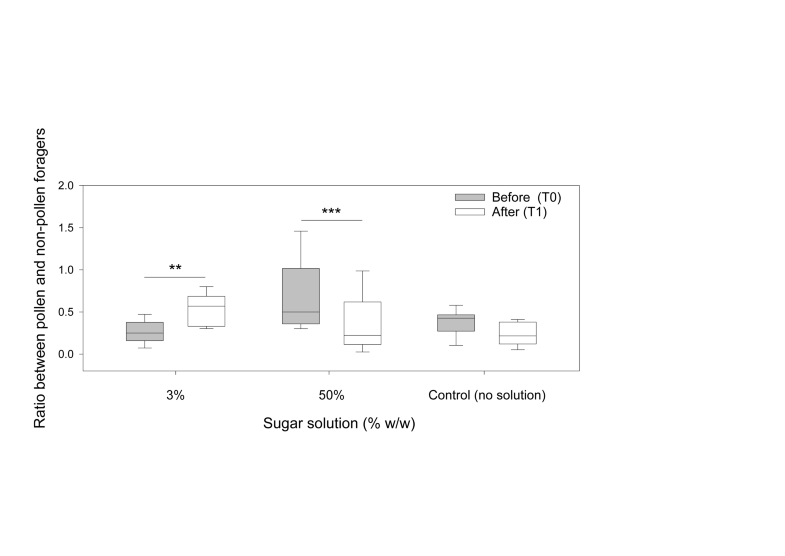 In the first experiment, we showed that bees that persisted in visiting the feeder when offered low-quality solutions were more likely to switch to pollen than those foraging only on highly concentrated solutions. 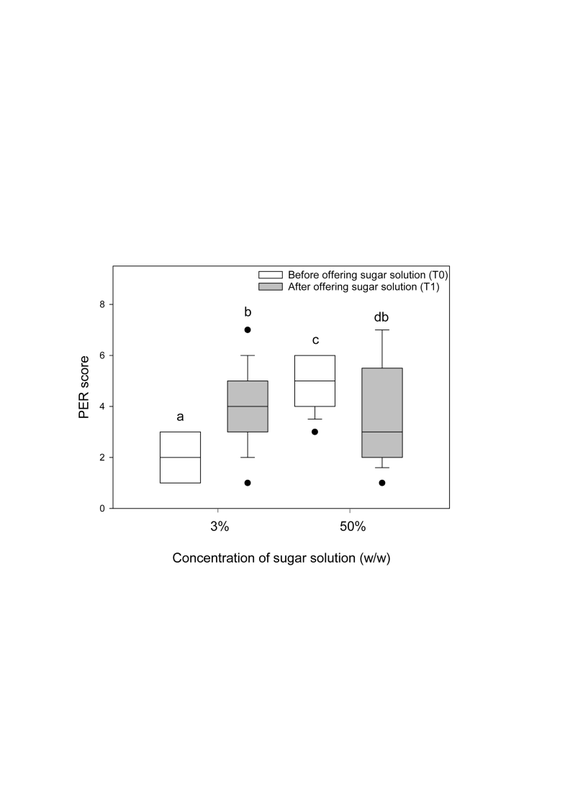 Looking at the collective responses, the ratio of pollen over non-pollen foragers increased after the input of a low-quality sugar solution and decreased after the input of a high-quality sugar solution. 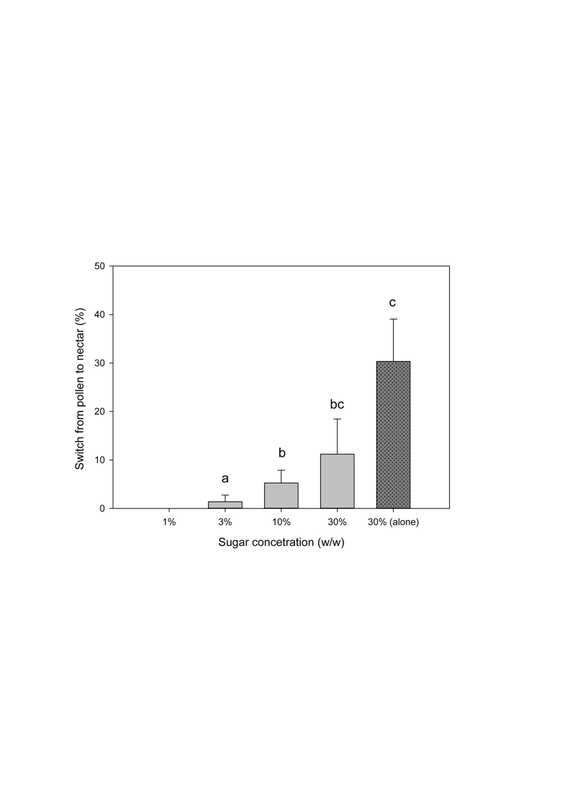 We conclude that the profitability of nectar sources interacts with the sugar responsiveness of bees, thus driving foraging preferences for pollen and modifying the pollen foraging activity of the colony. The results also show that bees integrate gustatory information from both rewarding resources based on local cues available either at the foraging site or inside the hive. Switching between resource types could be adaptive for honeybees that specialize in either nectar or pollen foraging. This would allow them to react to changes in the foraging environment. Although we observed that switching behavior is constrained by the responsiveness of bees to sugar, the switch from nectar to pollen (and vice versa) is an active decision of the bees in response to the decreasing or increasing profitability of pollen versus nectar sources. Given the ability of some bees to switch between foraging tasks based solely on gustatory cues available at the foraging site, we investigated whether source-related information conveyed inside the hive also affects colony foraging activity towards nectar and pollen resources. 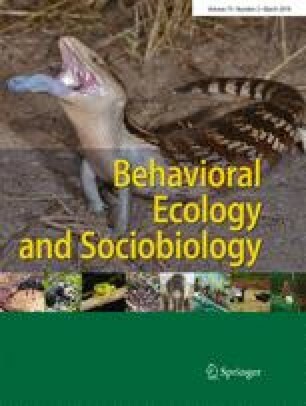 We observed that behavioral plasticity of individuals can be integrated into a social response by colonies reallocating their foraging forces according to the food-related information available inside the hive. The online version of this article ( https://doi.org/10.1007/s00265-019-2644-5) contains supplementary material, which is available to authorized users. We thank W. Farina for the fruitful comments and discussions at the early stage of this project and to MJ. Corriale for help with statistical analyses. This study was partly supported by Consejo Nacional de Investigaciones Científicas y Técnicas (CONICET) and by grants from Agencia Nacional de Promoción Científica y Tecnológica (ANPCYT), University of Buenos Aires and CONICET to A. Arenas.